Woodrow wins at Sligo Business Awards. 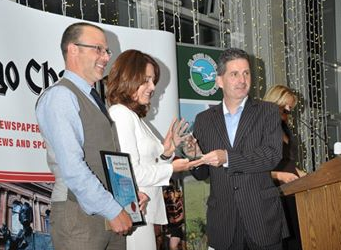 Woodrow Directors were delighted to accept the Best Environmental & Heritage Award at Sligo Business Awards 2014. Team Woodrow were delighted to win at the Sligo Business Awards 2014 run by The Sligo Champion and Sligo LEADER Partnership. The company entered the environment and heritage award and were recognised for their innovative work in a mobile app development; community training, static bat monitoring at height and their future plans for the business. Pictured are company Director’s Will Woodrow & Sharon Eastwood accepting the award before thanking the many support bodies available to Sligo businesses including Sligo LEADER Partnership Company, Local Enterprise Office and Sligo Women in Business network. The staff and colleagues had a well-earned night off at the ceremony!